Color: Solid (red and cream), bi-colored (chocolate, black, fawn, or grey with tan markings), brindled and dappled. 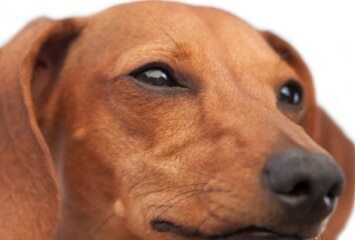 Is a Dachshund the Right Dog Breed for You? The Dachshund can be well suited to urban or rural living, as they can be active outdoors, but require only moderate exercise. They are playful, intelligent and can be affectionate companions. They are alarm barkers and without socialization can be prone to snapping at strangers and children. They can possess a stubborn nature and can be very vocal and even destructive when bored. They are considered an average shedder. Coat can vary from short to long, and grooming needs increase with the length of coat. 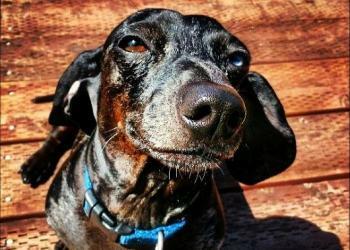 Photo above: Tucson, a four year old Dachshund enjoys the California sunshine. 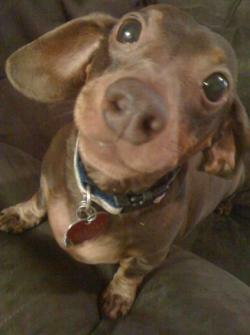 Submitted by Sally C.
Photo above: Hershey, a ten year old Dachshund standing on the couch. Submitted by Shannon J. 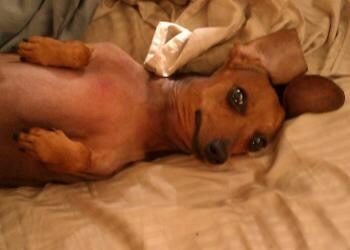 Photo above: Bailey Marie, a seven year old Dachshund from the Lone Star State. Submitted by Kristen D.